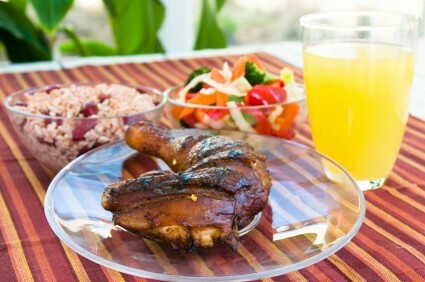 These mouth-watering, aromatic, enticing Jamaican food recipes that are easy to prepare and are some of my favorite. 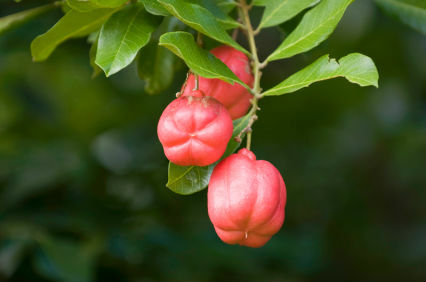 The picture below is the ackee pod on its tree. The pod is picked when it opens on the tree then we make our national dish - try the recipe below. Jamaican Foods are spicy and pungent, can be greasy and filing, are a blend of African, Chinese, Indian and European mix, but these recipes are heart-healthy, lower in fat - especially saturated fat, and low in cholesterol and sodium. 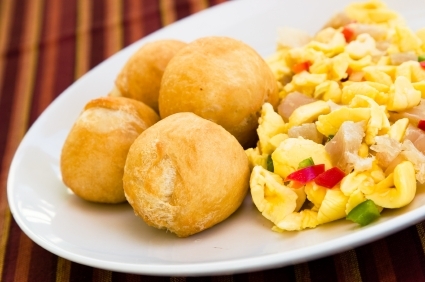 Ackee is Jamaican's national dish. This red skinned fruit, which is treated like a vegetable, and can only be eaten after the pod opens. Unripe and un-open ackee is poisonous. The seeds are discarded and the lobes are carefully cleaned of a thin red membrane before being boiled. Soak saltfish overnight or for three hours. Refill pot with fresh water then boil for 10 minutes. Strain off hot water, run cold water over saltfish to cool then pick-up or flake into small pieces. Boil ackee for 2 minutes only, strain and put aside. Heat oil and saute thinly sliced onion, sweet pepper, garlic, paprika, black pepper, thyme in a saucepan. Then add and stir in saltfish and ackee, cover and simmer for three minutes on very low heat. Ackee is usually eaten for Sunday breakfast and served with either boiled green banana, fried plantains, fried flour dumplings or roast breadfruit. 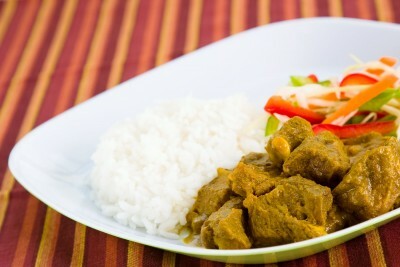 Goat is another favorite of Jamaican food recipes. Wash goat meat, drain then add all the seasonings. Let stand for a hour or overnight in refrigerator. Place meat with all the seasonings in a dutch pot, add a cup of water, cover and simmer. Keep adding 2 cups of water and cook until tender. To make gravy just add 2 tablespoon of bread crumbs and let simmer for another three minutes. The term jerk refers to the special spices used to season the chicken that when cooked is succulent, spicy and scrumptious. Combine all the seasonings then rub seasonings over chicken. Best if marinate in refrigerator overnight or for six hours or more. Place chicken in nonstick or lightly greased baking pan. Cover with aluminum foil and bake for 40 minutes. Then remove foil and continue banking until meat can be easily pulled away from bone with a fork. Hopefully, your taste buds were opened by our Jamaican food recipes and by making small changes in the way you and your family cooks and eat, you can help reduce your risk for heart disease and stroke. Enjoy and keep the heart of your family strong.